As you pull into the driveway and two-car garage from sleepy South Shore Drive, you are greeted by a pretty landscaped patio that may come in handy for lunch with your visitors or just to get relief from the sun. The slate entry foyer leads you into the vaulted ceiling of the great room that architect Glen Aria has made the focus of this subtle beach house. Its redwood walls, brick fireplace, new carpet, and panoramic windows take full advantage of the sweeping views of Suttons Bay New carpet in living room and new hard service kitchen counter tops with beautiful new iridescent sea spray glass back splash walls in kitchen. The beach is the best in the area..sugar sand and and beautiful clear water fantastic for swimming and just enjoying the shoreline and the boats that come in and out of the bay. Walking distance to the Village of Suttons Bay. High water has taken part of beach but we had reinforced stone wall with back fill of sand so still beach area. Fabulous fall color, winery tours pure Michigan at its best. The fireplace and AV/TV center separate the great room from the full kitchen that has been outfitted with the best appliances and accessories you might need for dining in high style in the adjacent bay view dining area. All new hard service counter tops and glass tile back splash new in 2011. A step through the sliding doors opens out to the deck complete with Brown Jordan patio furniture. Five steps down and you are on the most beautiful sugar-sand beach to be found. The beach tapers into the water and is ideal for children or even a midnight swim. The master bedroom opens onto a more private section of the deck and also has a magnificent view of the Bay. Keywords: Beach House Currently taking reservations for summer 2019 peak season $3,800 per week. 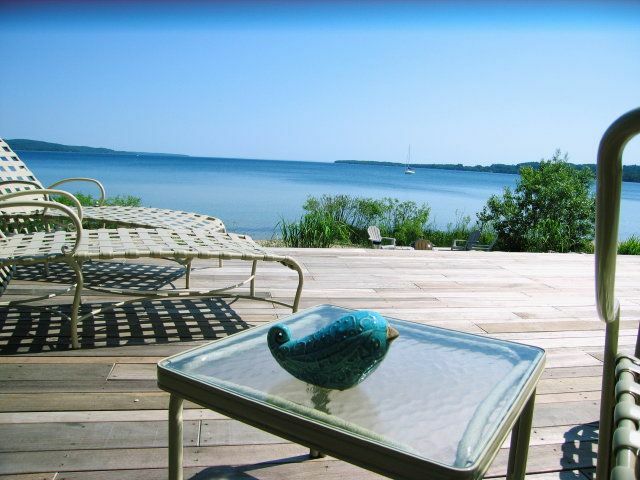 Best beach in the area and walking distance to the Village of Suttons Bay on a quite street. huge deck right on the water. 2- bring own bath, beach and kitchen towels both bathrooms have been gutted and all new. large living room 20 by 20ft. large screen in living room, small flat screen in master. the beach is the best in the area not a single rock or zeebra mussell Guest bedroom has two twin beds. All kitchen utencils provided, all bedding, sheets blankets provided. Please bring your own towels, kitchen, bath and beach,Both bathroom redone, all new. Beautiful views, close to village and playground for kids. House was very clean and well laid out, you could see the water from several rooms. Beautiful views to relax to.Close to wineries, towns and orchards. Great beach house in a perfect location. Difficult to step away from the house with these views but once we did, we were able to explore, hike, kayak, shop, wine taste and a new favorite...walk to the Hop Lot Brewery. Lots of fun. Perfect location! Rented kayaks & paddleboard from Sutton’s Bay Bikes ( they deliver) & had great time using them in the more protected area of Grand Traverse Bay. Beautiful bike rides along coast to Stoney Point & across the street to Leelanau Trail. Less than 1/4 mile to Hansen’s Grocery. Beautifully maintained George Açaí home (1970’s?). Loads of space in living room and on deck for extra dinner guests. Well equipped kitchen for making real meals. Very clean. So great stay at our beach house. We try to improve it every year. Wonderful location and view. Great communication with owner. This was a great home in a wonderful location. We walked to Sutton’s Bay a couple of mornings for breakfast. Everything was immaculately clean, and, as an extra touch, there were two rolls of toilet paper in each bathroom as well as a couple of rolls of paper towels and hand soap in the bathrooms. Teri was great to work with, and she went above and beyond in her communication with us. The only struggle (which was COMPLETELY personal) was the lighting. We were here on a few rainy days, and the house is lit primarily by lamps. It was cozy, but I could never seem to get it bright enough for my taste. The summer months would probably be totally different. Thanks for letting us stay! This is a gem in Sutton’s Bay. glad you enjoyed your stay. Yes we have had a few rainy over cast days. We must better label the two four caned lights in living room Two in front of fire place and one on each corner of south end of living room. There is also a full strip of lighting recessed above all the drape molding running the full north end of living room. Thanks for your input. The beach house was well equipted. We enjoyed both the outdoor fire pit and the indoor gas fireplace. The private beach is great for small kids. The location is also really great, a quite street close to the grocery store, the bike trail to TC, and the town center. Overall, its a great place to get away and disconnect. remember to bring bath, beach and kitchen towels. We only provide bed linens No towels. Cleaning fee is $150 Thanks MY NORMAL RATE IS 3800 PER WEEK WE HAVE A SPECIAL OF 2900 PER WEEK FOR BALANCE OF SUMMER SEASON!